1407 ⊙/ / American/British Zone - rich collection on KABE hingeless preprinted pages with useful issues, as well first issue of stamps for Germany after WW II., ribbon and net overprints on numerals and worker, partly with examinations, however very conservative estimated, special- and commemorative sets, export fair souvenir sheet twice and so on. Favorable! 1411 American/British Zone - wonderful mint never hinged collection, in the number of a major listing complete with all issued stamps in the Lindner T hingeless printed form ring binder. As well first issue of stamps for Germany after WW II., ribbon and net overprints on worker including the light 60 Pfg. Overprint, all 52 values ribbon and net overprints with photo certificates Schlegel BPP, all fours values peace pigeon with net pattern overprint with photo certificate \"the condition is perfect\" Andrew Schlegel BPP, 1 RM. Numeral with ribbon and net pattern overprint and photo expertize \"the condition is perfect\" Andrew Schlegel BPP, 2 Pfg. 5 DM buildings wide perforated, 2 Pfg. 1 DM buildings close perforated, 1-5 DM buildings high stair, export fair souvenir sheet and so on. An exceptionally beautiful quality object! 1582 /⊙/ American/British Zone - interesting lot the buildings issue in a large stockbook accommodated with all denomination value, as well lots of mint never hinged material including margin copies and corners of the sheet, blocks of four, multiples, Mark value and so on. With also an interesting part close perforation with better values as for instance 50 Pfg. Twice, 80 Pfg. Seven times, 90 Pfg. Three times and so on. Treasure trove for specialists! 1675 /⊙/ American/British Zone / Federal Republic of Germany - extensive inventory in a large thick stockbook accommodated with lots of material, with also the help for the aged souvenir sheet pair, American/British Zone with export fair souvenir sheet, as well Federal Republic of Germany with numerous first issues including Lower House of German Parliament 1949, 100 years stamps, Stephan, St. MaryÂ´s Church, all sets helper of human resources, Wuppertal set and so on. Favorable valued! 1867 American/British Zone / buildings - interesting mint never hinged lot of the building issues, mostly in multiples and parts of sheets with different denomination value, also the 25 Pfg. Close perforated in the block of ten from the left lower corner of the sheet with plate number 11 and so on. A delightful inventory for specialists! 1872 ⊙ American/British Zone - extensive used collection on lighthouse hingeless preprinted pages with plenty of better issues including first issue of stamps for Germany after WW II., ribbon and net overprints on worker, buildings, as well special- and commemorative sets and export fair souvenir sheet. Favorable valued! 1877 / American/British Zone - interesting collection with useful issues on stock pages. 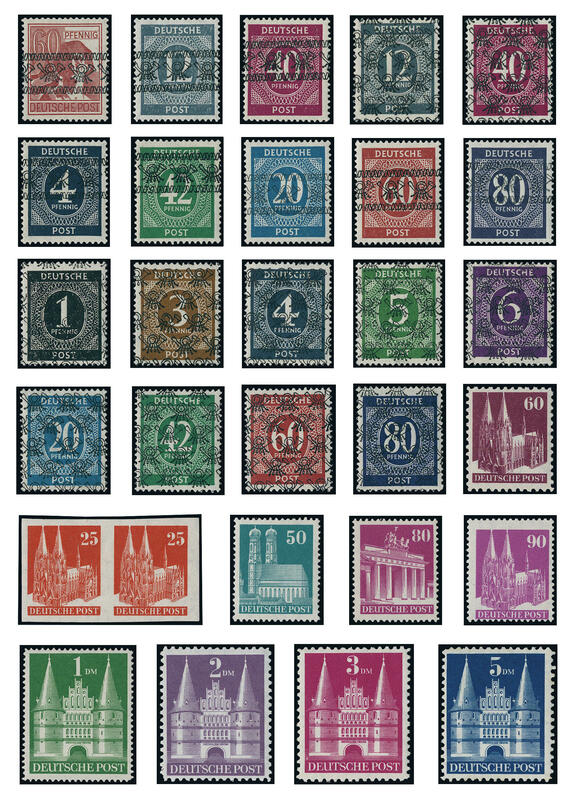 As well first issue of stamps for Germany after WW II., a good part ribbon and net overprints, however unchecked thus hardly valued with useful issues and varieties, as well a good part buildings with 2-90 Pfg. Wide perforated, 2 Pf. 1 DM close perforated, special- and commemorative sets, export fair souvenir sheet and so on. Favorable valued! 1883 /⊙/ American/British Zone - rich collection in the KABE spring back binder, partly a little specialized, including an abundant part first issue of stamps for Germany after WW II., a great many ribbon and net overprints, with also better numeral values, however not current expertized thus without guarantee, special- and commemorative issues with complete sets, as well help for the Needy. Favorable valued! 1971 American/British Zone - nice mint never hinged collection on lighthouse pages, as well the ribbon and net overprints on worker complete including the light 60 Pfg. Overprint, all 52 values ribbon and net overprints on numerals in perfect condition mint never hinged expertized Schlegel BPP, 2 Pfg. 5 DM buildings wide perforated, 2 Pfg. 1 DM buildings close perforated, 1-5 DM buildings high stair, export fair souvenir sheet and so on. Furthermore as well unperforated values buildings. A very nice object! 2026 American/British Zone - nice mint never hinged collection on Lindner hingeless preprinted pages with useful issues. With also all values ribbon and net overprints on worker including the light 60 Pfg. Overprint, 2 Pfg. 90 Pfg. Buildings wide perforated, 2-5 DM buildings high stair, 2 Pfg. 1 DM buildings close perforated, special- and commemorative sets, export fair souvenir sheet and so on. Favorable! 2028 ⊙ American/British Zone - 1945 / 49, extensive used collection on Lindner pages. 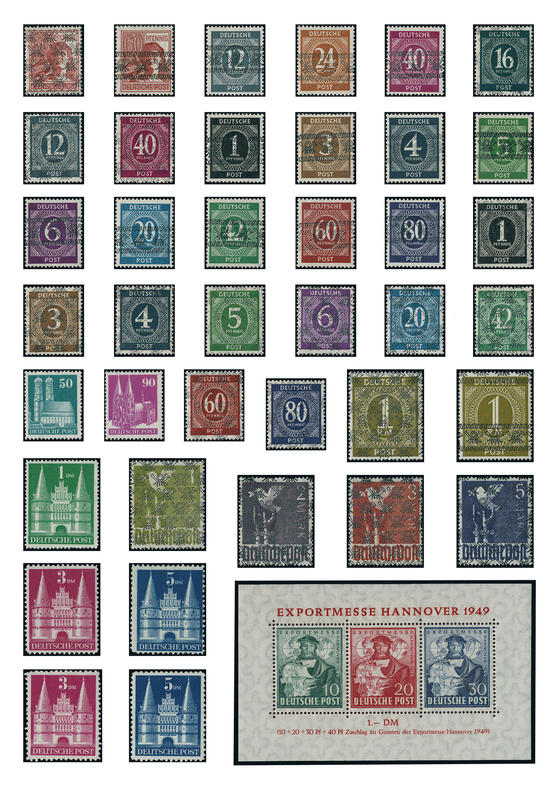 As well various issues from first issue of stamps for Germany after WW II., numerous ribbon and net overprints, with also numerous good numeral values, however unchecked thus without guarantee. Favorable valued! 2130 ⊙/ / American/British Zone - extensive lot ribbon and net overprints in a large stockbook accommodated, partly close one above the other puted, many various denomination value the worker issue, not be searched to colours and so on. Furthermore as well special- and commemorative issues, as well export fair souvenir sheet. Treasure trove! 2212 American/British Zone - very nice mint never hinged collection, in the number of a major listing complete, clean and maintained on lighthouse hingeless preprinted pages, with also first issue of stamps for Germany after WW II., ribbon and net overprints including the light 60 Pfg. Overprint, all 52 values numerals with ribbon and net pattern overprint in perfect condition mint never hinged expertized Schlegel BPP, frequently even from margin of sheet, 2 Pfg. - 5 DM. Buildings wide perforated, 2 Pfg. - 1 DM. Buildings close perforated, special- and commemorative sets, export fair souvenir sheet and so on. A very nice quality object! 2253 American/British Zone / buildings - nice mint never hinged special collection the buildings issue on Lindner pages with useful issues, color shades, 1-5 DM wide perforated, as well 5 DM in two strong mixed color shades, 2 Pfg. - 90 Pfg. Wide perforated more then complete, 4 Pfg. Unperforated, 6 Pfg. Unperforated showing a double print, 40 Pfg. In the vertical strip of three horizontal unperforated, 90 Pfg. In the horizontal corner margin strip of three vertical unperforated and so on. An attractive object! 2270 American/British Zone - nice mint never hinged collection in the Lindner T hingeless printed form ring binder including better issues. With also help for the aged souvenir sheet pair, complete sets, special- and commemorative sets, first issue of stamps for Germany after WW II., ribbon and net overprints on worker complete including the light 60 Pfg. Overprint, export fair souvenir sheet and so on. Favorable! 2317 / American/British Zone - nice collection on Lindner pages, predominantly mint never hinged formed with useful issues. As well first issue of stamps for Germany after WW II., ribbon and net overprints on worker, 2 Pfg. - 3 DM buildings wide perforated, 50 Pfg. - 1 DM. Buildings close perforation mint never hinged, special- and commemorative issues and so on. Favorable! 2339 x American/British Zone - interesting lot packed in a carton with issues mounted on pages, stock cards and so on, as well ribbon and net overprints including mint never hinged overprint errors, export fair souvenir sheet unused and used, 1-5 DM buildings mint never hinged and so on. Favorable! 2407 99 American/British Zone - nice and mint never hinged lot on stock pages, as well popular issues as for instance 2 Pfg. - 5 DM buildings wide perforated including the good plate flaw Michel no. 99 PFV, 1-5 DM buildings high stair, 2 Pfg . 1 DM buildings close perforated and so on. Very favorable! 2432 / American/British Zone - nice collection on Borek preprinted pages with useful issues, with also first issue of stamps for Germany after WW II., good part ribbon and net overprints, with also 2-84 Pfg. Numeral with net pattern overprint, all issued values expertized Schlegel BPP including 12 Pfg. Grey, 2 Pfg. 5 DM. Buildings wide perforated, 2 Pfg. 1 DM. Buildings close perforated, 1-5 DM. Buildings high stair, special- and commemorative sets, export fair souvenir sheet and so on. Favorable! 2481 American/British Zone - rich collection in the Lindner hingeless illustrated ringbinder with useful issues, with also first issue of stamps for Germany after WW II., ribbon and net overprints including the light 60 Pfg. Worker with overprint, special- and commemorative sets, 2 Pfg. - 5 DM buildings wide perforated, 2 Pfg. - 1 DM buildings close perforated, 1 - 5 DM buildings high stair, export fair souvenir sheet and so on. A maintained object!